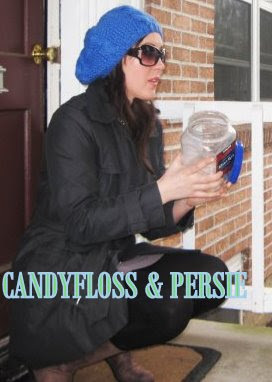 Candyfloss & Persie: You had me at "Bushy Tail"
Well, after spending alllllllllllll day Saturday working on my Maid-Of-Honor duties for my Sister and spending the bulk of today touring apartments downtown... I was so happy to return home to my favorite little companion. 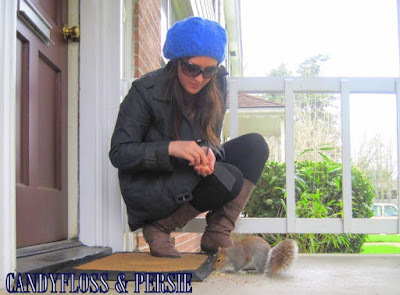 After living in my current place 3 plus years, I must say that I can't wait to get a new place... but I will be very sad when I no longer am greeted by my favorite Squirrel every day. With that said, I'm off to make myself a seething hot cup of tea, settle into my Vogue and then head off to bed. In quick Vogue news- Annie Leibovotz is being honored at the Georgia O' Keefe Museum. Read all about it (and enjoy the beautiful pictures) HERE. Your buddy is such a cutie... maybe you can pack it in a box and bring it with you when you move. Hahaha! Annie Leibovitz stole my heart with her baby Suri Cruise shoot for Vanity Fair a few years ago . . . and I can never get enough Carrie Bradshaw! Shame, he is so cute, why dont you just take him with?? Thanks for leaving a thought on my last post, great hearing from you. O,she is so cute! Take it with u! Moving is stressing and interesting...I am in it now.. I really like the pictures where everything black & white only your cap blue. How can I do that? Ha, looks like a great friendship. Our kids leave peanuts out for the squirrels, but the crows usually steal them. 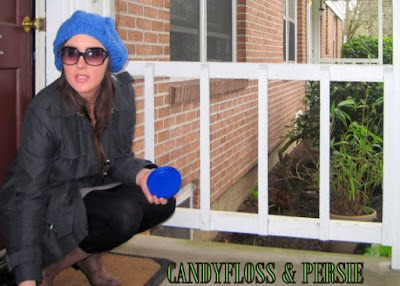 You look super cute in that beret!! Omg who is that little cute squirrel? OH MY GOD could that BE any cuter?!?! We don't have squirrels in AZ and I took about a million pics of them when bf and I visited his home town near Notre Dame. Adorable little shits! 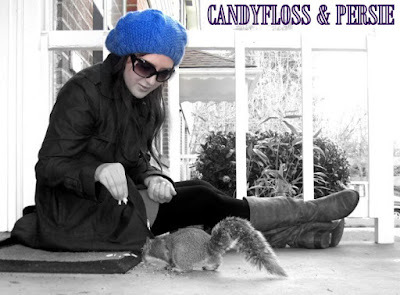 Caitlin ... what an adorable squirrel! Love your hat! oooh and the last pic of Ms Bradshaw! I love your blue hat... and the Annie Leibowitz photo is totally cool! 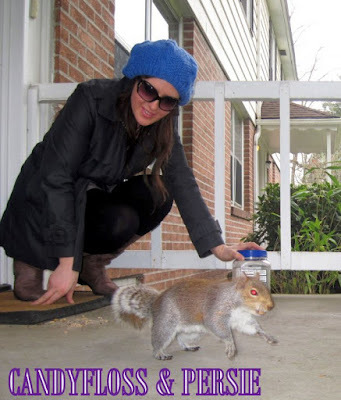 Oh my goodness that squirrel is so tame...that is cute that you have a little pet. I love Annie's photos of Carrie and Big. They make me so happy every time I see them! Awwww, so cute! Remember the scene in SATC when Carrie goes up to Aidan's cabin and freaks out over his "pet" squirrel? Makes me laugh every time. You've got to have a name for him! Andy was the name of the squirrel in Funny Farm. that's amazing how close he got to you for food. 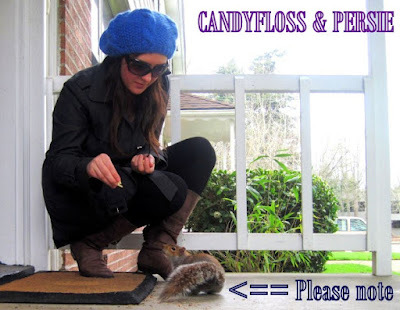 there are so many people out there that squirrels are naturally domesticated! that blue hat is notch girl. love love LURVE it! The squirrel is TOO cute!!! How sweet of you to feed her peanuts (or whatever you feed her)... and omG your sister is getting married?! That's so cool. I bet you're so excited. Keep us updated about how the wedding preparations go. Also, there's a show called The Good Wife. I don't know if you've heard of it, but it has Mr.Big in it too, and he's still so, so hot. Love him! 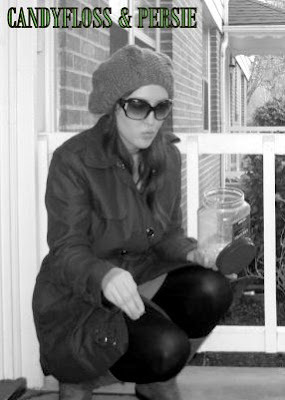 Of course you look chic even while feeding a squirrel! I still have not seen the SITC movie..but I love Big. Ah that is so adorable! Love your outfit BTW and your hat especially! Also loving this picture of SACT it is so romantic. Have to get a look at other works from her. btw, any news from the apartment hunt? 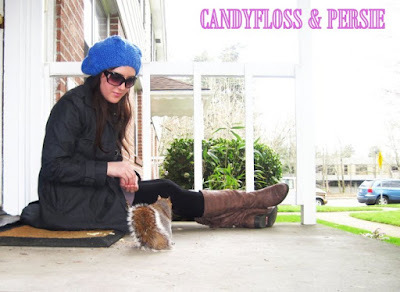 What a super cool squirrel buddy you have there, Caitlin!! Do yuo seriuosly get greeted by the cutie every day? Wow! It's like a pet squirrel :) You should take him with you to your new apartment lol really like your outfit, btw! The hat is such great shade of blue! Awwwww, look at you and your little friend. SO cute! And Annie is a genius. Love her Vanity Fair covers! 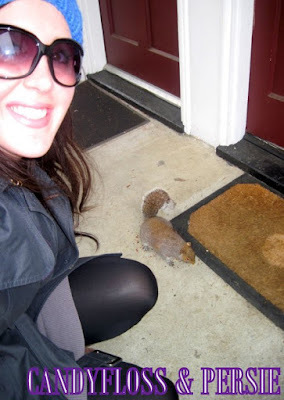 Omg how'd to get the squirrel to stay so close! lol. cute hat! Your little friend is so cute... how in the world did you get him that close? And how did you get him to stay long enough for pictures?? Adorable! Love yoru all-black outfit with the beret of the right colour! are you serious? 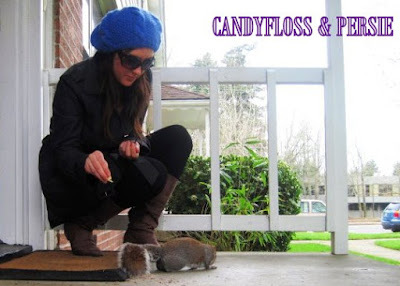 oh wow having a pet wild squirrel is like my childhood dream come true! oh you'll have to tell the next habitants to feed him! Squirrels for friends? You, my friend, are legit. SO cute! awww!! such a cute little squirrel! !